Prompt action during the first few minutes of an emergency can have a huge impact on the survivability of the victim. This article provides guidelines on how to properly assess the victim’s airway and breathing. In any emergency situation, it is very important that you remain calm. If you have witnessed or arrived at the scene of an accident, the first thing you should do is to make sure the environment is safe of any immediate danger. Once safety is guaranteed, you can now start providing first aid treatment to the victim. Learn effective methods of responding to emergencies by taking St Mark James training courses. If you find a person who appears to be unresponsive, gently tap or shake the shoulders and ask loudly, “Are you OK?” Speak clearly and with a loud voice. Avoid vigorously shaking or moving the victim as there may be a neck injury. If victim is unresponsive, call for help. You may leave the casualty in his or her present position. If it is not possible to assess the victim in his present position, carefully turn the casualty onto his back, making sure that the body is well-aligned, particularly the neck area. Keep the airway open. There are two ways of opening the airway. Place your one hand over the forehead and apply gentle backward pressure so the head tilts. Using your other hand, open the victim’s mouth and check for any obstruction. Remove any foreign objects, including dislodged false teeth, but leave dentures that are well fixed. Place your fingertips under the victim’s chin and carefully lift the chin. If the neck injury is apparent or suspected, support the back of the head while lifting it. Avoid over-extending the neck. Follow these same techniques for a child. However, for infants, place one finger under the victim’s chin and carefully tilt the head back. Avoid over-extending the neck. After clearing the airway, check for signs of breathing for 10 seconds. Always remember: Look, Listen, Feel. LOOK for the up/down movement of the chest. FEEL the breath using your cheek. A non-breathing victim may present obvious signs and symptoms that include unconsciousness or stillness, bluish lips or pale skin, absence of chest movement, and absence of breathing sounds. This should be done simultaneously while checking for breathing. To check for pulse, gently press your index and middle finger over the carotid artery located on the side of the neck, just alongside the outer edge of your windpipe (trachea). If victim is breathing and with pulse, you can start checking for other injuries sustained such as bleeding. If victim is not breathing but with pulse, initiate rescue breathing until breathing is restored. 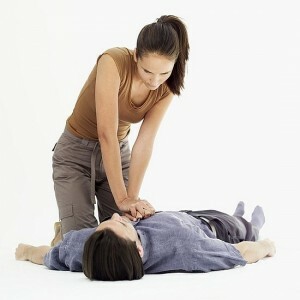 If victim is not breathing and without pulse, start Cardiopulmonary Resuscitation (CPR). It is essential that you have completed basic life support or advance life support training to gain proficiency with rescue breathing and CPR techniques. These trainings provide confidence and practical experience which is crucial in life-saving. To learn more about responding to emergencies take St Mark James training programs such as standard, emergency and childcare first aid. To find a certified St Mark James provider near you visit our “locations” page. We have providers located throughout Canada in Calgary, Edmonton, Winnipeg, Ottawa, Toronto, Vancouver, Red Deer, Halifax, and Kelowna.